Leading Pakistani textile brand LALA extended its fashion reach at the Aalishan Pakistan Lifestyle Exhibition 2014 in association with Trade Development Association of Pakistan (TDAP). Held in New Delhi, India, LALA’s participation commenced through a showcase of its collection ‘Empowerment of Women’, on 10th September 2014 of the Lifestyle event which was followed by an exhibition from 11th – 14th September 2014 at Pargati Maidan. For the showcase LALA collaborated with Samarpan Foundation, a non-profit charitable trust that supports orphaned girls, of whom several walked the ramp with the nation’s top models to showcase the brand’s signature collection. 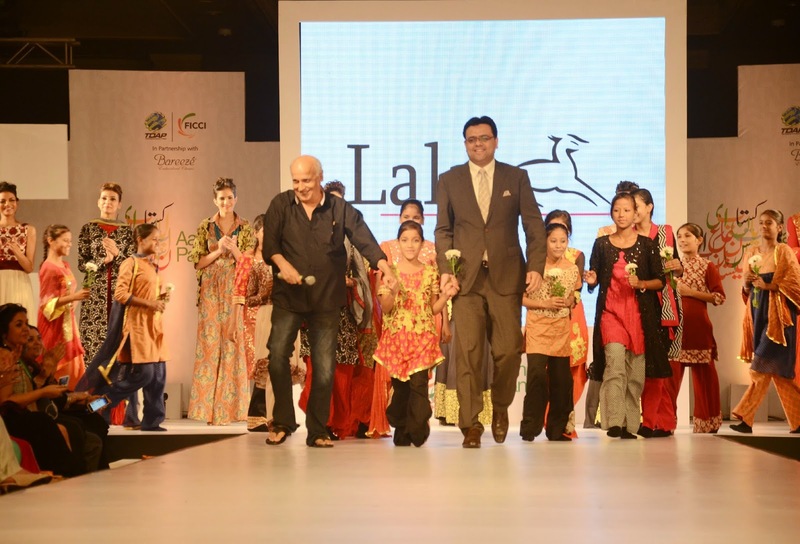 The finale was graced by acclaimed Bollywood film director Mr. Mahesh Bhatt who, accompanied by Mr. Pervez Lala, CEO, LALA, walked the ramp in support of the Orphan girls project. In addition to its showcase, the textile brand will also be managing an exhibition at stall numbers 111 to 116, where attendees can expect an array of fusion of modern and traditional designs with the finest fabrics throughout the duration of the exhibition. Featuring a fusion of modern and traditional design elements, the ‘Empowerment of Women’ collection consists of crushed lowers, jackets, angrkha, jumpsuit, bolero and sequenced jackets made from luxe fabrics including lawn, cotton, chiffon, jamawar and dobby in a dynamic color palette of coral, black, gold, blue beige, maroon and white colours. With the new collection, LALA endeavours to create a distinct new look to Lawn as a versatile fabric that can be utilised for Pret and Luxury Pret. Indeed, having started in Pakistan in 1947, LALA has today grown to encompass seven diverse retail brands providing accessible summer; midsummer and winter fabric ranges. Today, with their multiple decades of seasoned experience, the LALA brand continues to provide quality material through custom prints throughout the year and has expanded exponentially within Pakistan, India, Bangladesh, the Middle East and the UK. The brand is best known for their seasoned experience in manufactured, producing and retailing quality textile with a commitment to principled trade.